Over the next several years the domestic structural steel industry will face a broad range of external challenges. These challenges will come from competing materials, changing marketplace conditions and demographics, increasing imports, legislated material preferences, increasing emphasis on sustainability and resilience, and a tightening labor supply. Identifying and understanding these challenges is the first step to successfully addressing them as individual fabricators and as an industry as a whole. Brian Raff is the Director of Government Relations with the American Institute of Steel Construction. Since 2005, Brian has lead several marketing and business development roles within AISC and the National Steel Bridge Alliance. In 2013, Brian left the Institute to serve as Marketing Director for one of North America's largest structural steel building and bridge fabricators before returning to AISC in 2017. Mr. Raff graduated from Penn State University with a Bachelor of Architectural Engineering degree and received his MBA from DePaul University in Chicago, focusing on entrepreneurship and economic business strategy. John Cross is a registered professional engineer and Vice President of Special Projects for the American Institute of Steel Construction. He is a frequent speaker at seminars and workshops focused on marketing, construction economics, sustainability, and the early involvement of steel specialty contractors in the design and construction process. He is a voting member of the ASHRE 189.1 Standard Committee for the Design of High-Performance Green Buildings and the Consensus Body of the Green Building Institute. Located in the heart of River North at the prominent corner of Clark & Kinzie St. and in the same building as DineAmic Group’s Italian concept Siena Tavern, comes Barrio. Barrio is a creative take on traditional Mexican fare with pan-Latin and American influences. 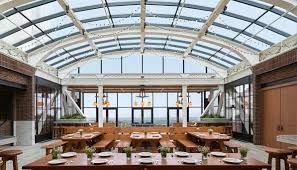 The 6,000-square-foot restaurant seats 200 people and offers a variety of dining options including bar seating and private dining. The kitchen is helmed by “Top Chef” alum, Chef Katsuji Tanabe, who has created a plethora of options for just about every patron. Join us for a great family style dinner! Committed participants will receive a separate agenda and communication regarding the Peer Group session within the next week or so.